Grow fabulous food and flowers from seeds, then save seeds to make next year's garden even better. Creating dinner from food you’ve grown provides a fantastic sense of accomplishment. Now, imagine the pleasure of starting plants from seeds, tending them, planting them in your garden, harvesting their fruits, and enjoying a delicious meal or bouquet. But that's not the end of the journey. Now you can turn around and save the best seeds for next year’s garden. Suddenly, you’re self-sufficient; you’ve grown your own garden from seed to seed. 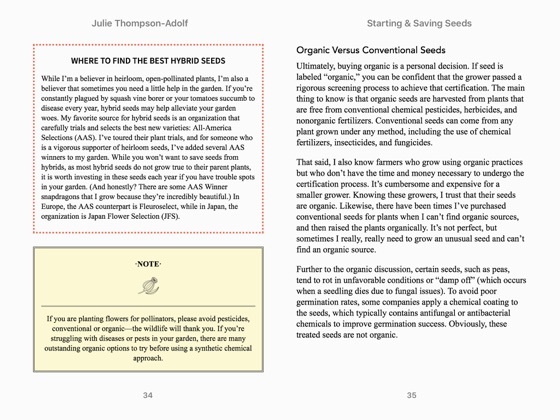 In this book, you'll find the tools you need to become a seed starting and saving champion. 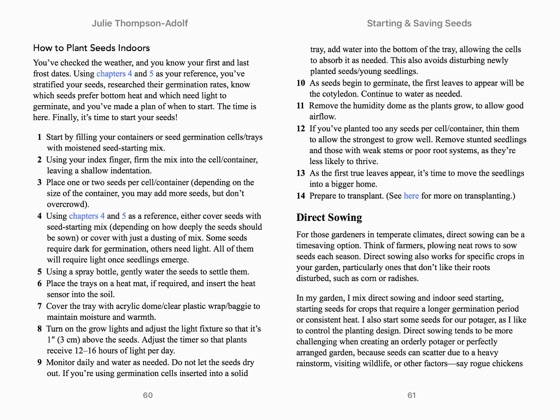 Author and gardening expert Julie Thompson-Adolf walks you through every step of the journey, making the entire process a joy. 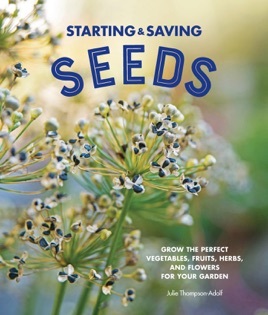 You’ll find hints to encourage stubborn seeds to germinate, lists of varieties to add to your garden, charts for quick growing reference, and simple DIY projects to aid your seed starting and saving adventure. (Learn how to make seed bombs and an indoor seed-starting station.) 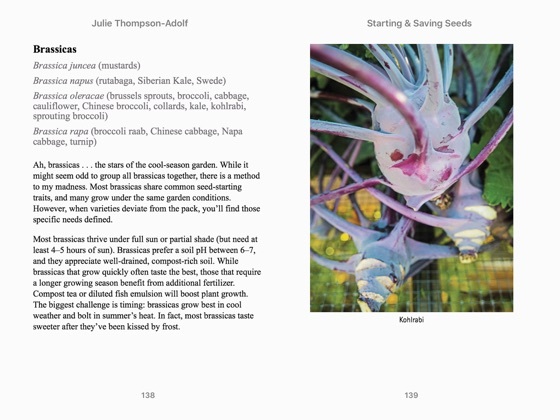 The extensive plant entries inside cover all the most popular vegetables, fruits, herbs, and flowers. 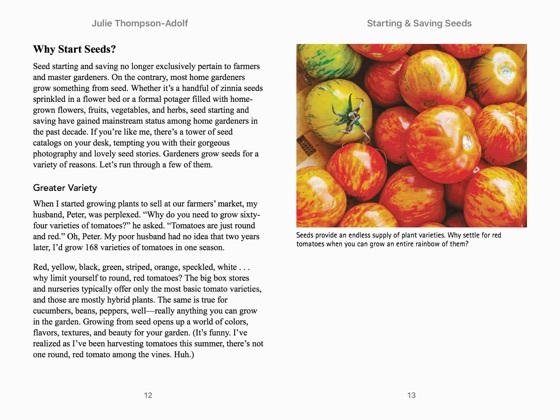 Get started with tomatoes, peppers, eggplants, and melons, or chamomile, cosmos, sweet peas, and poppies—accompanied by beautiful photography from Libby Williams. 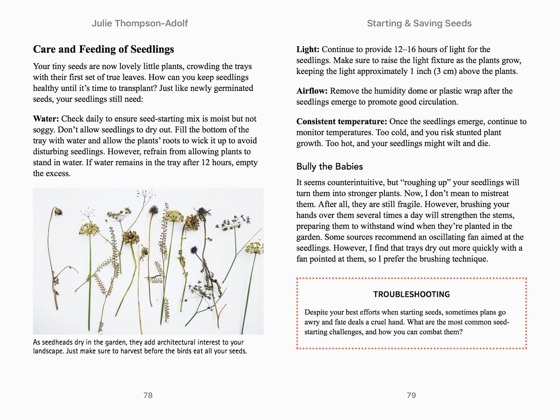 Whether you’re an experienced gardener new to seed starting and saving or a brand-new grower, you’ll soon have healthy, productive, beautiful plants for your garden.